Filipinos love to have fair complexion but foreigners go in Philippines and other tropical countries to get tanned. How ironic, right? We are highly influenced that having a Caucasian whiteness brings a beauty so there are tons of whitening product that are out in the market. Here are some of the listed products that are effective. Thank to Asian secrets for the Asian secrets body scrub and whitening soap that I received last month. I won from the bloggers giveaway and I am so thankful for the package. I love natural products. When I heard of natural products, it usually caught my attention to learn more about those products. Last year a fellow mommy blogger has introduced Human Nature products. From human nature website, I have learned that most of their products are 100% natural, no harmful chemicals and 100% Philippine made. I bought 50ml bottle of human nature sunflower seed beauty oil. I replace my face cream with this and I can see a good improvement with my face. Unlike other face creams or oil, human nature sunflower oil is not greasy. My face glow and I think that my face started to become smoother after the day that I applied this. What I love about this is that it there is no foul smell on the oil. Aside from my face, it moisturizes my hand that it get rids off my chapping skin problem when my fingers are stress due to my online work. I just noticed that when I tried to apply a makeup foundation cream, my face became sensitive and some rashes appeared. I think because of the natural ingredients of the human nature sunflower beauty oil , my face reacted to foundation cream that has chemical content when I apply it to my face. I would still continue to use this beauty oil but instead of using a foundation cream, I will use a baby powder. Currently, human Nature Sunflower Beauty oil cost PhP129.75 at 50 ml bottle. You can order online or visit their kiosk or store. My sister and I went to MCO beauty salon for a Keratin hair treatment. I have mentioned the benefits of hair keratin treatment in my recent post about “Keratin Hair Treatment is healthy“. My sister have problem with her hair that frizz after being curled a few months ago at a salon. She is planning for hair rebonding but I told her that I already bought a metrodeal voucher for our hair keratin treatment which is my birthday gift for her last month. We bought have the hair keratin treatment and hair cut. We also added extra services like pedicure for her and hand paraffin treatment for me. 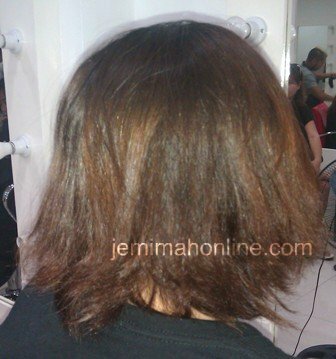 The hair keratin treatment procedure takes about 35 minutes to one hour depending on your hair type and volume. The service at MCO Beauty salon was nice. They are friendly and they have a good service. My sister was satisfied with her pedicure, haircut and keratin treatment. In my part, I enjoyed my new hair cut. It gives a good body to my hair and lighter feeling. I think the hair keratin treatment strengthened my hair and makes my scalp healthy. 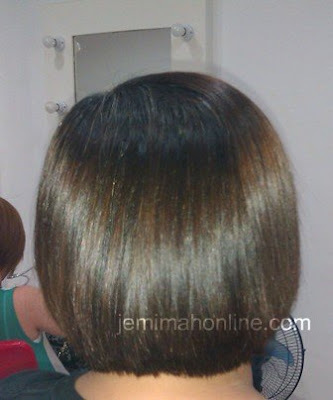 My hair is naturally black, shiny and straight that is why after the keratin treatment, I do not notice any difference. The problem that I have is falling hair. MCO beauty salon gave some advice on how to prevent falling hair like avoid stress, have a hair treatment at least once a month (it could be hair treatment at home), have your hair cut monthly (it will make your hair grow healthier), do not pick white hair just cut it (it will avoid the white hair from spreading). If you are near in Manila area (Recto, Tutuban Divisoria, Bambang), MCO beauty salon is recommended for your hair cut, hair treatment needs and other services. They are located at 1323 Sanchez Ext. Tondo, Manila with Telephone number at 806-6619 . I started to notice hair fall at the age of 28. The hair fall was not too many but I was alarmed why it happened. Based on my observation, I experience hair fall when I don’t have enough sleep and rest, stress and not eating healthy. Using different shampoos or conditioners and shampooing everyday may also lead to hair fall . Before I have a thick black, healthy-looking hair but now my hair is not as healthy and thick as before. The best way to bring back my healthy-looking hair that I think is to keep my body healthy. I am afraid that hair fall can eventually lead to worst hair loss. As early as possible, it is better to do something better now to keep a healthy hair and body. As a woman, it is important to have a beautiful healthy hair. If there is a serious hair loss, we should consult the expert with the hair loss treatments for women. In my case, I think hair fall was caused by the chemicals from the shampoo that I have used before. Stress and lack of sleep are also other causes. Good thing that there are several treatments and natural products to use as an alternative to the old shampoo that I used. I was planning to have my first hair treatment at a salon. Yes! This is going to be my first try for the hair treatment at a hair salon. I am not really fond of undergoing hair and beauty treatments at a salon or beauty center because I usually do the natural way of keeping myself in looking good or healthy. Another reason is budget. If I have an extra money, I spend it wisely more of an investment that I can earn. The main reason of not trying the hair or beauty treatment at a salon is that I am afraid that those treatment might cause some side effects and damage so I prefer to keep my natural beauty. I am really in a tight schedule with tons of work online. Every summer season I usually sleep super late in the evening or it would take me early the morning. My eyes, hands, fingers and mind are so tired but my body lacks exercise. In times like this, the most stress and aching part of the body was my hand, arms or back. I know that my body needs a full rest and massage but not until the loads of work diminish. Thanks to the makers of Salonpas that even without massage it makes me feel better after putting the patch on the affected area. Inside the bedroom, you will find different kinds of pain relief. I have Efficasent oil, omega pain killer, camphor menthol, Soothing Gel and many to mention. 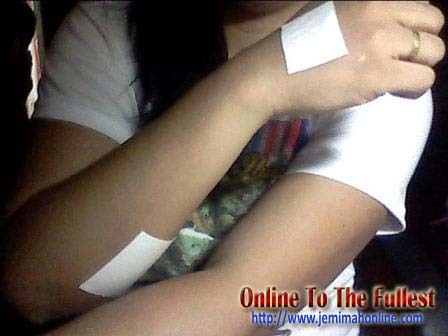 But, Salonpas is the best pain relief remedy for my body pains. Good thing about it is that is has newly improved vitamin E on the patch so it won’t hurt your skin. 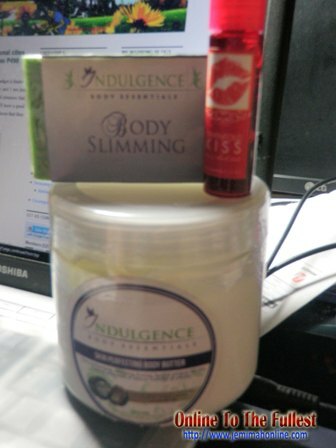 Two weeks ago, I order online the Indulgence skin perfecting body butter and body slimming soap. I also purchase this product from stripit.multiply.com, the place where I purchase my Hair removal cold wax that I posted a review last month. The photo above is the actual product that I received from the shipping. The price of the Indulgence Skin Perfecting Body Butter is Php 500 and the seaweed Slimming soap cost Php45. I bought the body butter to deeply moisturize my skin especially for my chapped dry skin on my stressed fingertips that I also shared here in my previous posts. Since they also offer other products I also bought a seaweed slimming soap since I love natural products. I also aim to lessen the appearance of my stretchmarks that I had after giving birth and I have read that body butter may help reduce it. When I received the package, they also gave me a freebie of lip and cheek tint. I have used the body butter for almost two weeks now and I can say that I am happy for the results. It truly deeply moisturize my skin because now I don’t have the chapped dry skin on my fingertips. The scent of the body butter smells like a leaf or smells like a clean cotton. It is not greasy when applied just make sure to massage the skin evenly with the body butter. My skin becomesÂ more moisturize and smooth. My stretchmarks are still there and I think it lightens a little by 5%. I think I’ll have to wait for more than months for the effect on the stretchmarks. I am glad that I have found this body butter. I will wait for three months of continuous usage of this product and I will update my review for the results in my stretchmarks. I really need a moisturizing lotion, rich and non-greasy for my hand and body. I have been searching online for the best lotion to pamper myself especially for my dry chapped skin on my fingertips area. There are many products online but not all beauty products are healthy.Â Good thing I have found a better website where you can find health and beauty products. 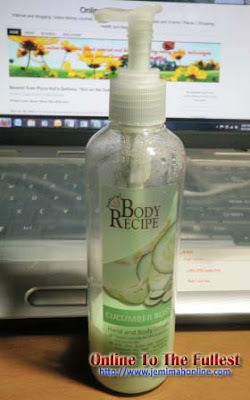 Since I was searching for a moisturizing rich lotion, I have found a Softening Body Lotion at http://www.naturesbest.co.uk/. The products that they offer here are very interesting because I love products with natural ingredients. I am choosy when it comes to using a beauty product and what I like about the Softening body lotion is that it is long lasting and has non-greasy formulation. Most of the moisturizing rich lotion that I have used was not easily absorb by the skin because you have to rub and massage it for a longer period of time but this lotion says that it is a rich easily absorbed body lotion. 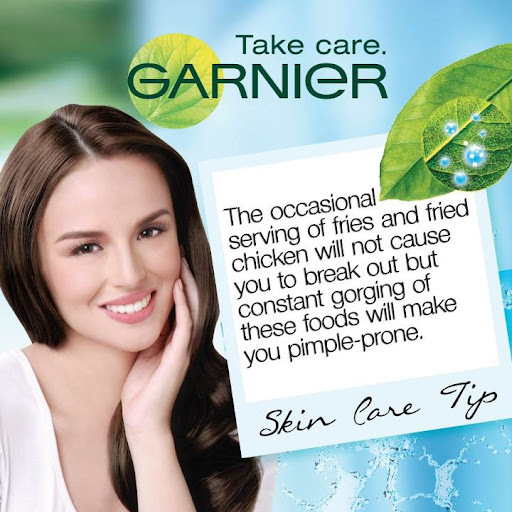 Aside from that, the natural ingredients are so great. Imagine the natural ingredients are cocoa butter, green tea extract, sunflower seed oil, shea butter, olive oil, linseed oil, patented flax seed extract, grape seed oil, aloe vera, natural vitamin E. It is almost complete to keep a healthy beautiful skin. I believe that it will moisturize my dry chapped skin on my fingers when I use this product. When I got pregnant and gave birth two years ago, stretch marks appeared on some parts of my skin. I have read that lotion rich in shea butter and vitamin E help in reducing the appearance of stretchmarks so I would go for this product. Also, when you are aging especially for women, we should take more vitamin E to keep our skin and body healthy still looking beautiful.